I have been taking my dog Zoey to Send Rover Over for just about two years, since she was just a puppy. Zoey is a shy and timid Havenese, and initially she would quiver when I would bring her in. Now, she has gained trust because of the care she is given, she gets all excited when we walk in the door. Then about a year ago I got a second dog, Panda, who is a Pomeranian mix. This dog is the polar opposite of Zoey. She is eager to meet new people, but sometimes has a hard time with other dogs. I was nervous to bring her in, but she was welcomed with open arms, and she has never had a problem. I believe this to be because she feels safe at Send Rover Over. It isn't just about the grooming, which is fantastic, but also about taking our pets to a place they enjoy going to. All of the people who work for Send Rover Over are so pleasant and kind, love animals, and do an amazing job making my animals look and feel good. I would recommend them to anyone looking for a groomer. I was referred by a friend who’s dogs also love going to get groomed, and would not look to go anywhere else! It's extremely clean, well-stocked, and very fairly priced for their services. They obviously love their work, and the animals they groom. Last year at Christmastime, they presented us with the best picture ever of our freshly groomed puppies, perfectly posed and looking mighty pleased with themselves. Our hearts were captured completely!!! We have been taking our dog Chance to Send Rover Over for over a year and have never been disappointed. Not only does he leave looking fabulous, but the lovely staff are so kind and positive. It is a place I trust leaving Chance, who can be somewhat difficult to handle (but seems to love it there and I always hear great reports at pick up)! These grooming sessions are a must for my furry baby! After rescuing Champo, the friendly philosopher, we noticed he was grumpy after his initial visits to various groomers. Champo is not one to complain, but at length he confided to us his displeasure at all the clipping and trimming and bathing. 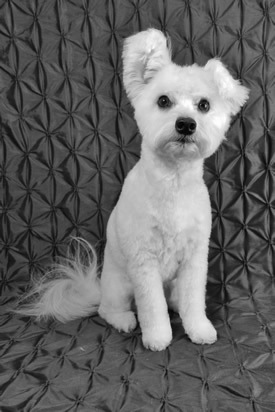 Some of these early groomers reported that he even growled and snapped at them, behaviors wholly unbecoming a friendly philosopher and quite unsettling for the groomers. Champo loves his part-time trainer, though, so the three of us consulted her about a groomer. She immediately recommended Marit Vike at Send Rover Over as someone who works well with rescued canines. Sure enough, along with some clever tips from his trainer, Champo has come to accept his required hygienic regimen with aplomb. Marit never complained about his fractious behavior and only concentrated on how to increase his comfort. It worked, Champo looks and smells great, he's happy (arf-arf!) and so are we! We deeply appreciate the services provided by Marit and all the staff at Send Rover Over. Everyone there seems to enjoy their work and their clientele and to take pride in it. Thank you all.